your baby's skin is pristine and precious. that's why we create our products with organically-grown fibers: cotton, hemp, and bamboo. unlike synthetic fabrics spun from petroleum products, our fibers are created from plants grown of Mother Earth. because these plants are organically grown, no insecticides, pesticides or other toxic residues come into contact with your baby––or you. founder melinda ott, mother of four, created the company in 2007 and named it for her own children: elijah, ari, and twins zachary and zoey ("e-a-z-z"). she began sewing her blankets because nothing on the market was correctly sized for twins. every item is designed hand-sewn from organic fabrics. our passion: creating healthy, hypoallergenic baby products with a new mother's specific needs in mind. we're dedicated to creating products which your child will enjoy for years, and may even be passed along as your child grows. our generously-sized products can accommodate twins, triplets––but moms of preemies love them, too. for instance, the all-in-one blanket is large enough not only to keep baby cozy, but also to allow mom to breastfeed in public, modestly. 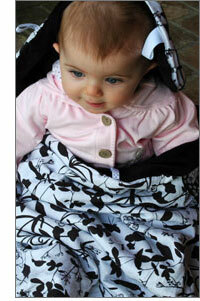 lush ribbons affixed along the blanket's edges provide a tactile signal to your baby that it's time to nurse. and our crib sheets are made with a large continuous elastic band, to stay secure on all mattresses––even with a mattress pad underneath. and although they are all made by hand, all of our products are (whew!) completely washer-friendly.